After a complete redesign last year, the 2016 Ford Mustang in Surprise gives shoppers even more to rave about with a new SYNC 3 infotainment system, added package options and other updates! Continue reading our 2016 Ford Mustang review for details, plus see vehicle comparisons at the bottom of the page if you want to know how Mustang competes against sports cars like the Chevy Camaro and Dodge Challenger. Mustang is offered in V6, EcoBoost, EcoBoost Premium, GT and GT Premium trims. A basic version of the SYNC system is offered on entry-level models, but if you want to own the all-new SYNC 3 system it comes standard starting on the EcoBoost Premium trim and up. The new system has updated voice recognition software capable of better understanding natural speech and new touch controls that give users the ability to swipe and pinch the screen just like with a tablet or smartphone. In addition, SYNC has a simplified, easier-to-read menu, along with offering faster performance and automatic Wi-Fi updates when a compatible phone is paired with the system. 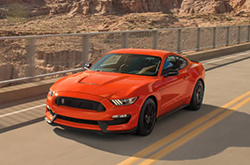 Those shopping for a 2016 Ford Mustang in the Phoenix area will also benefit from expanded package options. On select models, new California Special and Pony equipment groups have been introduced. The former includes a larger rear spoiler, 19-inch black alloy wheels, and special trim embellishments in the cabin and on the exterior. The Pony package is another excellent choice with a sporty side stripe, upgraded front fascia design, 19-inch wheels and pony logos on the floor mats. Furthermore, new features like hood-vent integrated turn signals (GT) and an optional black-painted roof (EcoBoost, EcoBoost Premium, GT and GT Premium fastback) have been added for the 2016 model year. Along with the trims we mentioned above, a super high-performance Shelby GT350 debuts this year! 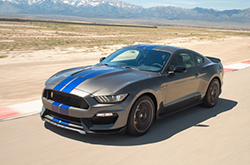 Research the model and you'll find that 2016 Ford Mustang reviews laud the track-tuned Shelby for its 526-horsepower V8, MagneRide dampers, sport-tuned brakes and exclusive aerodynamic elements. No matter the trim you choose, when you buy or lease a 2016 Ford Mustang in Surprise, Arizona, you won't be disappointed with its unmatched performance, style and features. Stop by Surprise Ford to check out inventory and learn about financial incentives. 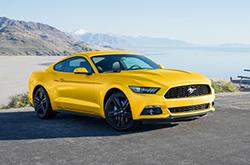 Compare Ford's most current model of the Mustang to its rivals and we're certain that you'll choose it over vehicles like the 2016 Dodge Challenger, Hyundai Genesis, Chevrolet Camaro and the Nissan 370Z. You'll love the Mustang's long list of noteworthy qualities, including its bargain MSRP and useful features. When compared to the forementioned vehicle options, in terms of price it's clearly a fabulous value, making it a well-liked choice among Ford customers in Surprise. Glance over our Mustang Facts list; look just under this paragraph for bullets. Do you want to know more about the 2016 Ford Mustang's features and specs? After reading the review above, visit Surprise Ford and experience the Mustang up close. We take our job to provide the best reviews written by automotive experts - it's just one more thing that makes us a well-known Ford retailer in Surprise. Every paragraph comes brimming with beneficial data, specs and research - just what you need to make smart decisions about your next Ford purchase. Find out more about our fantastic group of vehicles; visit the research library to review and compare other models on sale at Surprise Ford now!